Adding color solely to the central portion of your image, the 100 x 150mm Pale Coral Stripe Filter from LEE Filters adds a warm, muted pink coloration to the middle of the frame while the top and bottom of the image remain neutral in color. This effect is ideal for times where the brightest elements are centrally located, such as during sunset or sunrise, and adds increased color for more dramatic results. This filter is constructed from optically correct resin, measures 3.9 x 5.9" / 100 x 150mm, and is compatible with the LEE 100mm filter holder. Produces a colored central portion of an image while retaining neutral portions on either end for creatively enhancing the look of scenes. Ideally suited for use when photographing sunsets or sunrises. Filter measures 3.9 x 5.9" / 100 x 150mm, is 2mm thick, and is compatible with the LEE 100mm filter holder. 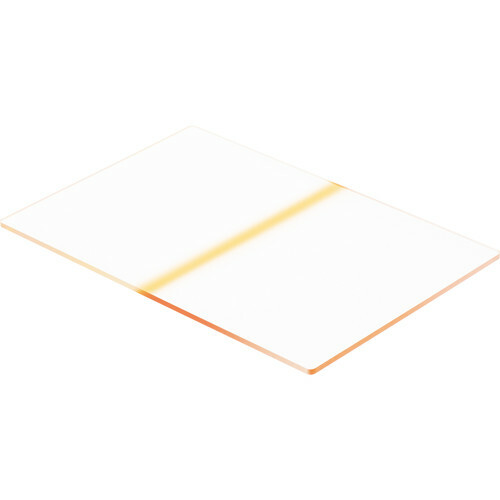 Box Dimensions (LxWxH) 7.0 x 5.0 x 0.1"
100 x 150mm Pale Coral Stripe Filter is rated 5.0 out of 5 by 3. Rated 5 out of 5 by Christopher S. from AMAZING FILTER! I purchased this 4x6 Pink Stripe Resin Filter by LEE Filters for shooting sunsets and landscapes. I had never heard of a stripe filter before, but it made perfect sense to have something like this for those few occasions where a grad or reverse grad just wouldn't work. Be careful though - this filter has a pretty strong pink cast and you will need to take care in placing it just right in the composition to avoid a phony look. Although made of resin, this filter is of excellent quality and comes in a very nice filter pouch, something which some of the other manufacturers don't provide with their filters. A filter holder that allows you to slide the filter up or down is an ABSOLUTE MUST! Be aware that this filter is not always in stock and it can take several weeks to receive your order. Mine took about a month to arrive from B&H. Rated 5 out of 5 by Christopher S. from GREAT FOR SCENIC WORK This 4x6 Pale Coral Stripe Resin Filter by LEE Filters is the perfect filter to add just a little color to an otherwise dull landscape,seascape, or sunset. I also own their regular 4x6 Coral Stripe Resin Filter and sometimes it's just a little too strong so then I use this one. It comes in a great Cordura nylon pouch, that some of the other filter manufacturers don't provide with their filters. Rated 5 out of 5 by Christopher S. from Great for bright sunsets! Bought this for sunsets. Used it the first day I got it and it really saved me! It's good quality with no loss of sharpness when used in front of the lens and it comes in a nice pouch. Would you recommend stacking this filter with a polarizer or a blue soft edge grad ND filter using the Lee filter holder? Staking with a polarizer or a color filter is fine. It is important to make note that when stacking you can increase the chances of creating a type of flair. The light can bounce around between the filters to create the look of flair. When staking if you can it is best to use a lens hood or some cards to block the sun from hitting the lens.